The days of using fax machines to “get the transfer paperwork in” have been over for quite some time. In fact, clubs have been required to use FIFA’s Transfer Matching System (FIFA TMS) to process international transfers since 2010. FIFA TMS is seldom discussed, despite being a crucial part of every single international transfer. At its core, FIFA TMS is an online platform designed to ensure that football authorities have more details available to them on international transfers. Additionally, the online system defaults as a database that simultaneously helps increase transparency while reducing the potential for illicit activities such as money laundering. FIFA TMS streamlines a process involving multiple clubs, federations, the player (and sometimes multiple players) and FIFA. Before the introduction of FIFA TMS, a transfer could previously take days or even weeks to process. Conversely, the average processing time for an international transfer in 2015 was under seventeen minutes. This article highlights the fundamental role of FIFA TMS through the lens of Reevaldo’s recent transfer from Maracanã to Paddington United. Additionally, we also share the type of information required used to process Reevaldo's transfer in an effort to show what "transfer paperwork" actually looks like. Don't miss the footnotes --> 1 <-- which contain links to useful documents as well as additional insights on industry practice. Before a transfer can be officially processed and in order for a player to be eligible to play for his new club, an International Transfer Certificate (ITC) must be issued by the federation in the country of the player’s former club to the federation in the country of the player’s new club. Many of the data points each club submits must match up exactly, and if the buying and selling clubs are not in sync with entering in the key data points, the transfer will not be processed. This may seem like a daunting task, but every club is required to designate employees as “TMS managers” who are responsible for ensuring that the transfer is processed correctly. That said, Reevaldo’s transfer had an additional layer of complexity due to the third-party ownership issues. Paddington had never dealt with third-party ownership issues prior to this transfer. As a result, the club’s TMS managers sought additional training and guidance from the FA on how to navigate these issues within FIFA TMS. Maracanã and CSI, the third-party owner, entered into a deal whereby Maracanã sold 30% of Reevaldo’s economic rights to CSI back in 2014, when Reevaldo was sixteen years old. As this third-party agreement was entered into prior to 1 May 2015, the deal remained valid and binding, despite the ban on TPO. However, it was mandatory for all existing agreements to be recorded within FIFA TMS by the end of April 2015, and Maracanã and CSI duly complied with this deadline. At the time, Maracanã and CSI agreed that Reevaldo’s transfer value was around £1.2 million. Based on that valuation, CSI paid £360,000 to Maracanã in exchange for 30% of Reevaldo’s economic rights. When Maracanã sold Reevaldo to Paddington, the transfer fee was structured with a significant bonuses. There was a fixed fee of £6 million, plus an additional £5 million in performance-based add-ons and a sell-on clause entitling Maracanã to 20% of the profit made by Paddington from a future sale of Reevaldo. During the negotiations, CSI was unwilling to sell their interest in Reevaldo for anything less than £2.4 million payable in full immediately, which Paddington eventually agreed to. As required by FIFA TMS when a transfer involves third-party ownership, Maracanã declared that there was third-party ownership of Reevaldo’s economic rights and listed CSI as the third-party owner. Maracanã also uploaded the agreement into the system and listed the currency and amount being paid to CSI. Reevaldo’s transfer from Maracanã to Paddington United was fairly complex – beyond involving two clubs separated by nearly 6,000 miles away, there were also outstanding third-party ownership issues that needed to be resolved. Without FIFA TMS, this transfer could have taken weeks to complete and given the international dimension, the language differences, and the involvement of a third-party, this transfer would be inherently susceptible to not only simple errors but also potential money laundering issues. Using FIFA TMS, however, this transfer took fifteen minutes to process and all of the financial and third-party information was logged into the online system and completely transparent. Historically, third-party ownership had been an essential part of how many Portuguese, Spanish and South American clubs did business. Economic rights pertain to the fees arising out of a player's transfer. Clubs are the default holders of their players' economic rights, but prior to the ban, clubs (or players) could assign some of these rights to third party investors. 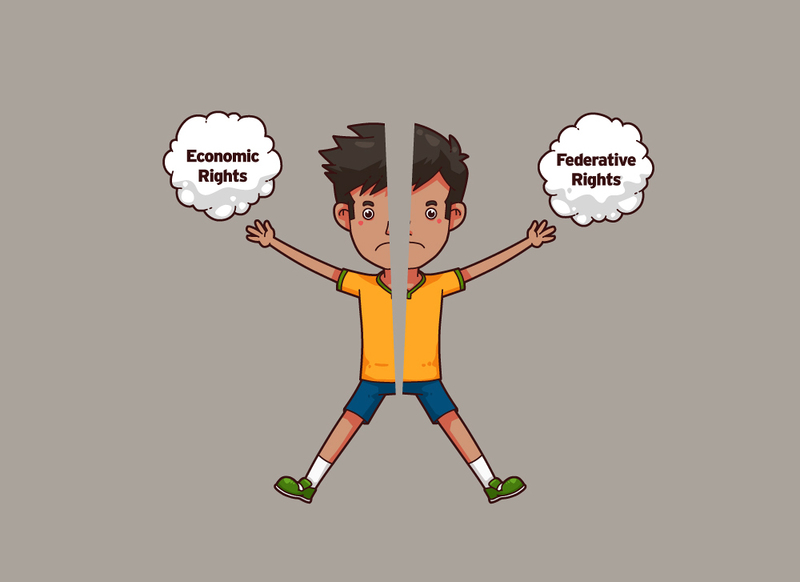 Federative rights pertain to the right to register a player for a club with a national association and stem from the employment contract the player signs with his club. These rights cannot be assigned to third parties. 1'500'000.00 GBP after the Player has made 25 Appearances in First Team Competitive Matches for Paddington United. 1'000'000.00 GBP after the Player has made 50 Appearances in First Team Competitive Matches for Paddington United. 1'000'000.00 GBP net of any deductions, after the Player has scored 15 goals in First Team Competitive Matches for Paddington United. 500'000.00 GBP after the Player has scored 25 goals in First Team Competitive Matches for Paddington United. 500'000.00 GBP if Paddington United finishes in 10th place or better in a season of the Premier League while the Player is registered with Paddington United. 500'000.00 GBP if the Player has been named in the Professional Footballers’ Association (PFA) Team of the Year while the Player is employed by Paddington United. Should a club fail to disclose or falsify documents in its submissions to FIFA TMS, disciplinary measures may be imposed. As described by FIFA TMS' own integrity and compliance counsel, "the TCF is essentially an inquiry into any form of alleged wrongdoing relating to an international transfer outside of the fourteen 'explicitly specified' ASP infringements, and typically concerns egregious and substantive breaches of the RSTP." Those cases relating to third-party influence and ownerhip in international transfers will be TCFs, rather than ASPs.6 TCFs are be referred to the FIFA Disciplinary Committee for a decision and possible sanctions. These sanctions can be much greater than what is provided for under ASPs. As one prominent example, Barcelona was fined CHF 450,000 and had a two-window transfer ban after violating international transfer regulations pertaining to minor players. It is seldom discussed,4 but FIFA TMS is fundamental to how international transfers are processed. Our hope is that this article helped shine light on a system that has helped process every single international transfer since 2010. TPO deals signed prior to 1 January 2015 remain valid and binding through their natural expiration date, but cannot be extended or renewed beyond that date. TPO deals signed between 1 January 2015 and 30 April 2015 were not permitted to be longer than one year in duration. The governing FIFA regulation on the TPO ban is Article 18ter of the RSTP. For an easily accessible background to third-party ownership, see this article written by Carol Couse. For more on discliplinary procedures, Kimberly Morris and Barry Lysaght at FIFA TMS have written a detailed article on LawInSport. how do foreign footballers get UK work permits?